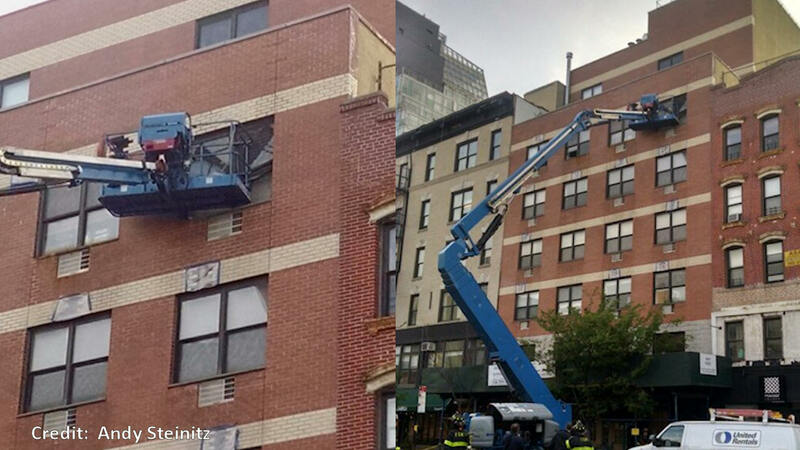 LOWER EAST SIDE, Manhattan (WABC) -- A cherry picker crashed through the window of a sixth floor apartment on the Lower East Side. A stop work order has now been issued for 137 Essex Street. A violation was issued for a failure to safeguard the site during construction operations. The top two floors of the building were evacuated as a precaution. A person was inside the apartment at the time of the crash, but they were not hurt. Building materials were being delivered when it tipped over and hit the building. The crew was in the process of fixing the facade when the cherry picker suffered a hydraulic failure. A heavy duty tow helped to take down the cherry picker. It is currently in a stable position. The New York City Buildings Department is checking the stability of the building.